One of the key elements that separate Formula One from other forms of motor racing is the superiority of technology used in the sport. Phrases such as data acquisition and telemetry are now part of the common language in the Paddock and teams have come to rely as much upon their technology partners as they do engine or tyre manufacturers. The BMW WilliamsF1 Team looks to HP technology to provide that vital competitive edge, via the data that is collected and analysed by the HP computing systems. These powerful and durable computers provide a constant flow of reliable telemetry data, from which the Team can make key tactical adjustments and mechanical improvements in order to maximise car and driver performance. Telemetry refers to the automatic measurement and transmission of data by wire, radio, or other means from a remote source. In Formula One this data includes vital information about engine performance, aerodynamic efficiency, oil pressure, tyre grip and brake wear, as well as numerous measurements taken from the car regarding the driver's progression on the track. Every second of every lap over 150,000 measurements are made by the WilliamsF1 BMW FW26's on-board computer from almost 200 separate sensors on the car. This data is then transmitted securely, using microwave technology, to the engineers in the pit lane, and compiled and processed simultaneously on a range of HP computing platforms for further analysis by the Team. Using specially created WilliamsF1 software, the computers translate the data into a numerical and graphical form that the Team can interpret. Once assembled, these graph readouts supply the engineers and technicians with an accurate, real-time picture of how the drivers and cars are performing. "We can track the car right round the circuit," said Sam Michael, Chief Operations Engineer at WilliamsF1. "We have multiple pages covering everything from the driver to the hydraulics, the steering angle into the corner, where he has lifted off the throttle… anything we want, really." To appreciate the intrinsic role that telemetry now has in Formula One you need look no further than the Paddock. Huge aerials and satellite dishes are perched on top of every team's truck, and along the pit wall more aerials and wireless devices connect the engineers, mechanics and drivers to the wider team network. Inside the BMW WilliamsF1 Team garage a rack of ProLiant DL360 servers review and analyse the performance of the WilliamsF1 BMW FW26. The technicians, engineers and mechanics alike can be found gathered around the screens during practice and qualifying sessions, searching the data for that vital millisecond advantage. The amount of data gathered for telemetry analysis is substantial. It has been said that if every piece of data recorded during a full race distance were printed out, it would cover a pile of double-sided A4 paper 2.5km high. However, this is exactly the information that the engineers need in order to optimise the car and driver's performance. In addition to the ProLiant servers, the Team use a variety of mobile computers and handheld devices to provide access to telemetry data wherever they are at the circuit. The team members predominantly use the Compaq Evo N610C Notebook but also take advantage of the award-winning iPAQ Pocket PC and the revolutionary Tablet PC to review data and study car performance. It is not only the engineers who value the telemetry. Many drivers also use the telemetry to evaluate their driving and locate areas where they could improve their lap times by accelerating earlier, braking later or taking a better line around a corner. Drivers can also use their team mate's telemetry data in an overlay to compare relative performance and highlight possible areas for improvement. "When you finish a session, and all the information has been downloaded from the car, you sit down with the engineers, look at the data and from that you make the decisions," commented BMW WilliamsF1 Team driver, Juan Pablo Montoya. "With the computers we can actually see what the car is doing. There are so many things you can overview with the car that you couldn't do before." Telemetry analysis, whilst being most evident at the track, is not confined to the specific circuit that the Team are visiting. Once the data has been sent to the ProLiant servers, either wirelessly as the car drives around the track or through a direct wirelink when the car returns to the garage, it is transmitted in real-time to the WilliamsF1 headquarters in Grove, England and the BMW headquarters in Munich, Germany for further analysis. 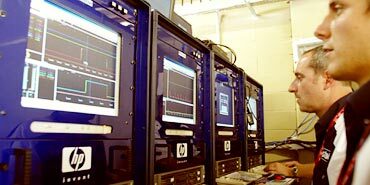 At the WilliamsF1 factory a team of engineers and technicians compile the data for review and for future development requirements. This team act as an additional resource, providing the engineers and mechanics back at the track with extra advice on optimising the car. The data is also used in a variety of other areas of car development. The raw information about the track - where the bumps are, how fast the car is travelling and how each corner affects the car - is compiled for future use on the Shaker Rig. This essential piece of equipment allows the Team to use a full-sized car and simulate the forces and effects that any given track will have, without having to wait until they actually visit the track itself. "We make full use of HP's breadth and depth of technological know-how," said Neil Davis, IT development manager at WilliamsF1. "This means that we can maintain a more efficient IT organisation internally and concentrate on the business of building and racing cars. HP's global presence ensures that we can count on their support whether at headquarters, tests or on the track." Telemetry data is also used in the development of future cars. Designers can use the information gathered to see how previous car iterations performed on certain tracks. They can then take these findings into account in their new designs and introduce new ways to improve overall car performance. "Track data represents the lifeblood of design," says Chief Designer Gavin Fisher. "It's the most direct means to determine car behaviour in differing circumstances, and from different input conditions. Analysis of this data is used to corroborate theoretical models, and stimulate leads for new designs. A new car is always the product of developing the good and eradicating the bad from the old car. Track data plays a vital part in this function." The face of telemetry has changed considerably over the years, as new innovations are introduced and rules are changed. Only last season the FIA, Formula One's governing body, permitted the use of bi-directional telemetry. This enabled the technicians in the garage to make adjustments to the car whilst it was still out on track. However, just a season later this facility has been banned from use. However Formula One changes over the coming years there is no doubt that telemetry will play an ever more important role in the sport. In addition, new innovations, such as the wireless network introduced by HP for the Team at the 2003 British Grand Prix, look set to further accentuate the role of data acquisition in the continued success of the BMW WilliamsF1 Team for this season and beyond.